At least 11 Shias, including two women, were killed and 23 others were injured after separate bombings occurred in Quetta’s Hazara Town and Kohat on Saturday. “People were busy in shopping near the intersection of Eid Bazaar in Aliabad when a suicide bomber struck with huge explosion,” Hazara Town Station House Officer Azher Hussain told Jafria News Media Team . “At least five people have been killed while more than a dozen were wounded,” he said. The cop confirmed the victims were Shias. He said that the terrorists targeted the Eid bazaar. “More than hundred people were present when blast occurred,” Hussain said. Quetta Police Chief Abdul Razaq Cheema confirmed the suicide attack and said the attacker blew himself up on the street after failing to enter Aliabad chowk. “Police have found the head and remains of the suicide bomber and the Bomb Disposal Squad has told me that 5 to 7 kg explosives were used in the bombing,” Cheema added. “The bodies and injured were taken to Combined Military Hospital and the provincial government has imposed emergency in all hospitals,” Home Secretary Akber Durrani told Jafria News. “Security has already been beefed up in Quetta but we are investigating that how the bomber entered inside Hazara Town despite tightened security measures,” Durrani said, adding that law enforcers cordoned off the area and collected evidence from the scene. “The death toll may rise. Children and women are among those injured,” a rescue worker said. “Four bodies and several injured were brought here,” a doctor at BMC said. “There was a huge crowd mostly women and children were busy in shopping for Eid ul Adha when the blast happened,” Zulfiqar, a witness, said. The Hazaras staged a protest demonstration against the suicide attack and blocked traffic by burning tires. Shia Political Parties and Notables have deeply condemned the Incident . Jafria Alliance Pakistan , Majlis e Wahdat ul Muslimeen , Shia Ulema Council have announced for a 3 Days Mourning All over Pakistan in Condemnation against the Ongoing Terrorism and Loss of Life of the Shia Community. 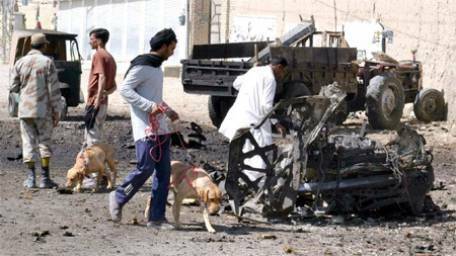 Separately, as many as 8 persons, including a three-year-old girl, were wounded in a remote-controlled bombing on Spini Road in Quetta. According to police, a box carrying an improvised explosive device (IED) was placed on the road near Bakra Mandi. “The miscreants detonated the bomb when Pashtoonabad DSP Naeem Khan’s vehicle came near,” said Aitzaz Ahmed, SSP operations. He confirmed that eight people were wounded while the police mobile escaped unhurt in the explosion. All the victims were passersby. Three-year-old Habiba Khan, teens Kifayatullah, Naik Muhammed and Watiullah were among the injured. The DSP was not the specific target,” Ahmed said. District Police Officer Salim Khan Marwat told reporters. At least two vehicles were damaged in the explosion, he added. He also said, “The explosion has left six people dead and 17 injured.” No group has claimed responsibility for the blast so far. KP Governor Sardar Mehtab Abbasi and Chief Minister Pervez Khattak condemned the bombing. The KP government has also announced compensation for the grieving families. This entry was posted in Asia Pacific, Pakistan News and tagged Balochistan, DSP Target, Hazara Town, IED Blast, Passenger Van, Queta, Quetta, Sipni Road, Suicide Blast. Bookmark the permalink.